The Writings of St. Francis of Assisi, translated by Paschal Robinson (1908). St. Francis of Assisi, lecture by Mandell Creighton (1892). St. Francis of Assisi, poem by Nicholas Vachel Lindsay (1916). 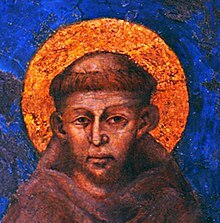 The Second Christ, Saint Francis of Assisi and Ecological Consciousness, article by Hendrik Viviers (2014). This page was last edited on 11 June 2018, at 14:19.